The birding in Costa Rica is legendary, with Toucans, Parrots, Motmots, Trogons and Oropendolas. But the thing I could not get enough of, were the Hummingbirds. 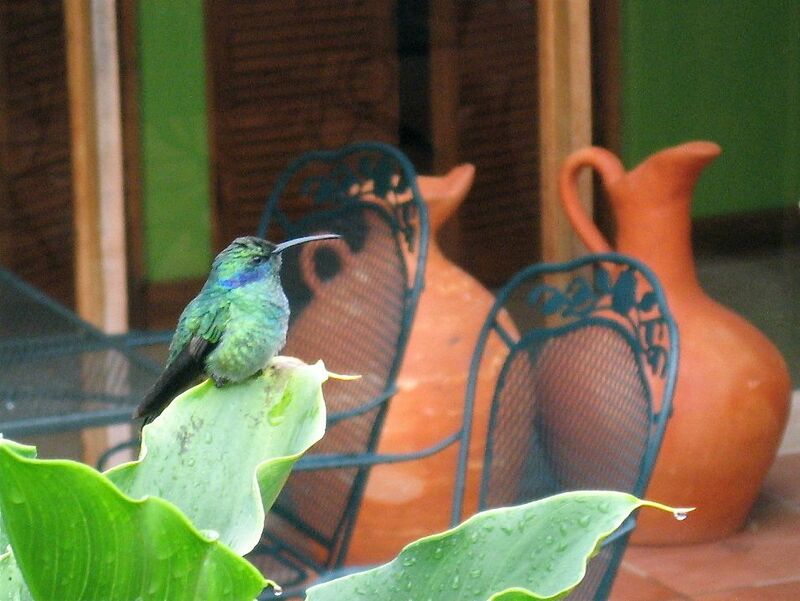 We saw 27 species of Hummingbirds in the 10 days we were there. This Green Violet-ear is a highland bird. I love him posed nicely against the terracotta pots. Have you been to Costa Rica? To see birds from other places check out Birdfreak’s Bird Photography Weekly. Migration makes for strange bed–er–tree fellows. I saw the Yellow-shafted Flicker and the Eastern Bluebird. What I did not see until the Flicker flew away was the Blue-headed Vireo. Can you see it? Ok. I know the picture is crappy, but try squinting. I put in some arrows to help. Three in a tree. Wahoo. I love migration. 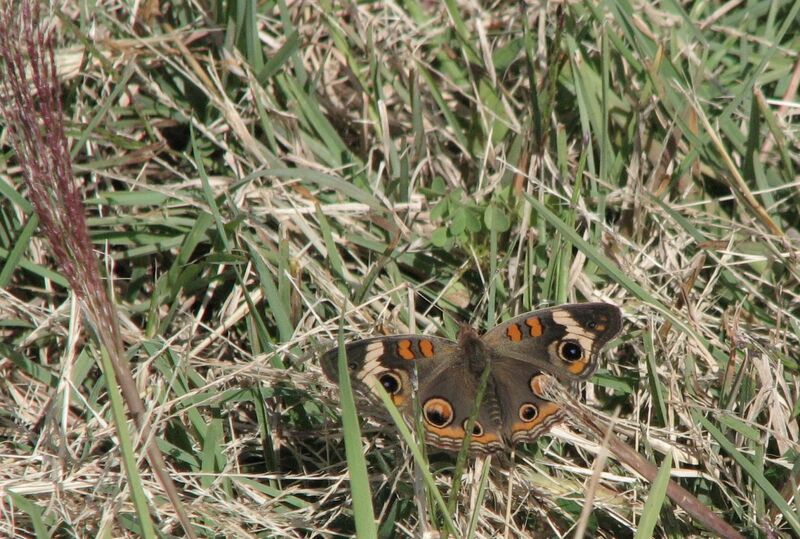 Isn’t it interesting that fall butterflies are fall colored. 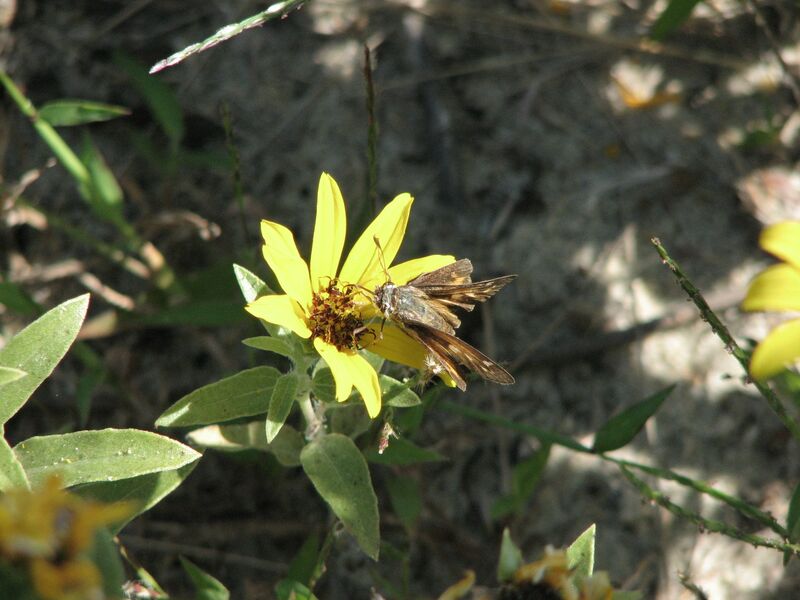 Sachem Skipper, I am so bad at IDing skippers. 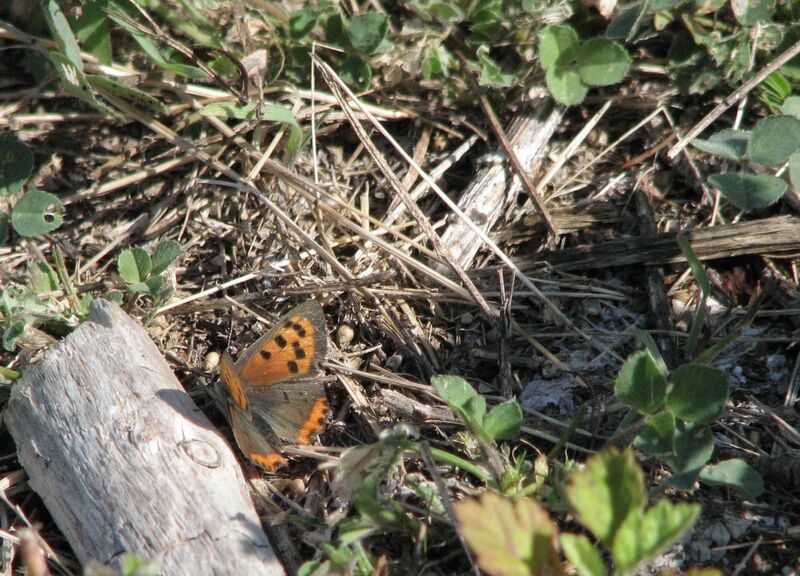 Scott Barnes, the naturalist at Sandy Hook, IDed this one. Last year at this time my sister and I popped over to Bermuda for a long weekend. The weather was glorious. We took pink buses around the island to walk pink sand beaches and shop in pink painted shops. We ate rum cake, swam with the dolphins, tried mopeding, and of course, birded around the island. One of my target birds was the Long-tailed Tropicbird. We finally saw many of them the morning we were leaving. 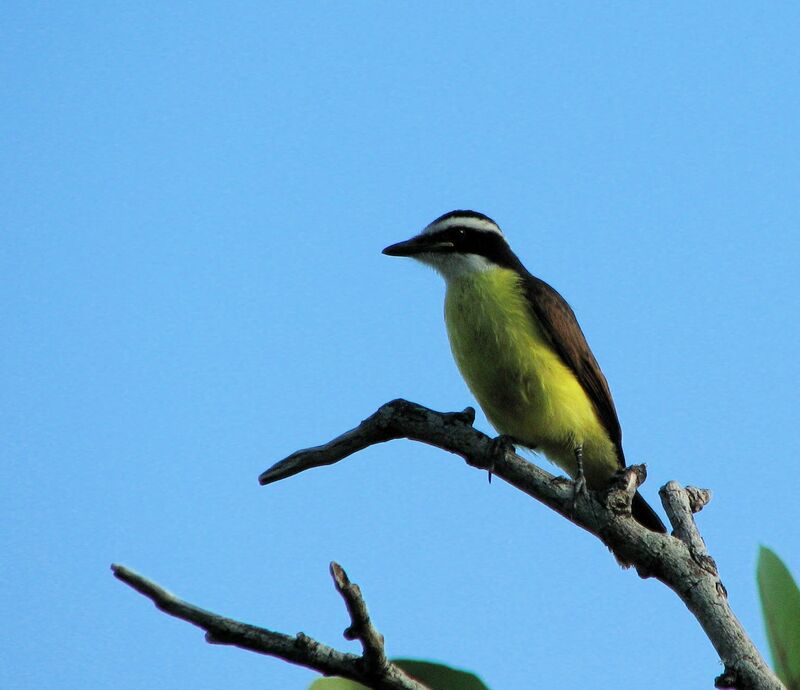 The biggest surprise was that the most common bird on the island was the Great Kiskadee. They were everywhere!!! Once you have heard them, even without seeing them, there can be no mistake. Check out other birds at Bird Photography Weekly and submit one of your own. Paul pulled up to the ATM, stuck in his card and punched in $300. He had held out as long as he could. He needed cash. There was no time to waste. The machine whirred and spit out a receipt that said INSUFFICIENT FUNDS. Paul slammed this fist against the front of the machine. He put the card back in and asked for $200. Again, INSUFFICIENT FUNDS. Crap. He HAD to get to the meeting place. He racked his brain. Maybe if he went home, he would be able to find some cash under the sofa cushions. He snorted at the idea. That would not be enough. Maybe he could call a friend and borrow some emergency money. He ran through a list of his friends in his head and sighed. He had already borrowed from everyone he knew. He frowned. As a last resort there was always credit. He wondered how close he was to maxing out. Paul pulled into the empty lot of the fire station to check his bags. Maybe he had some unspent cash stashed from the last visit. His rummaged through all of the bags in the trunk. His stuff was there. Perhaps he hadn’t needed all of it. But it had been such a steal. As he was kicking the tires in frustration a cop car pulled in. Paul nodded and quickly got back in the car and pulled away. The last thing he needed was a ticket. He drove to the park to see what was around. He scanned the area. Nothing. He sat in the parking lot with his head sunk on the steering wheel. Well, that was it. He was finished. He wasn’t going to make it this time. He wanted it so bad he could taste it. Why did these things always happen before payday? He sat up and took several deep breaths. OK. Stay calm. Think clearly. How much would it actually cost? Paul slowly got out his cell phone to talk to his fiancée. To beg her one last time. “Please tell me you are not going up there”, she replied. He considered lying. The hesitation was enough. She hung up on him. He hit redial. 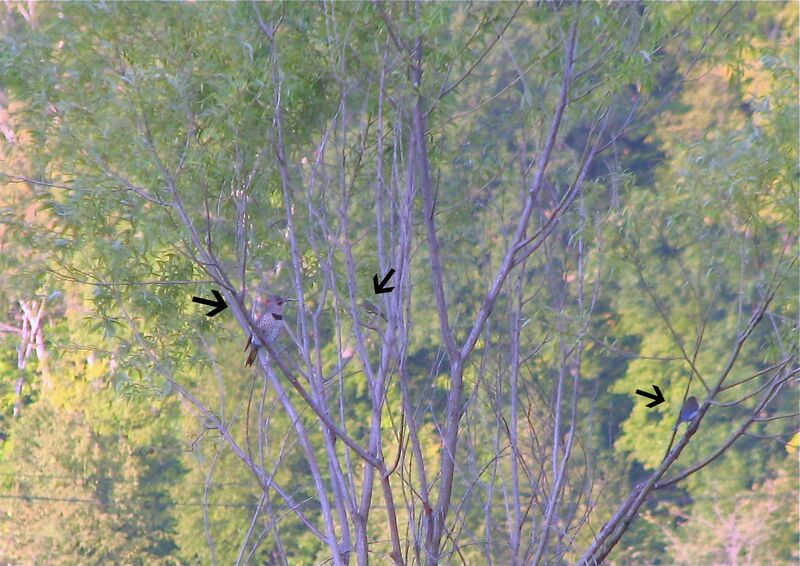 “ I know, but honey, it is a Red-footed Falcon. It doesn’t even live on this continent. It is a once in a lifetime thing.” He knew he was groveling. He didn’t care. There was a heavy sigh on the other end of the phone. I pulled up to the stop sign at the end of Beech Road heading to work after the Thursday Morning birdwalk. I glanced both ways and then up. Way above me a hawk soared, making lazy circles in the sky. It was pretty high but as it turned and twisted in the air, the tail flashed red. Migration is in full swing here, but this beautiful Red-tailed Hawk obviously had no intention of hitting the highway er, flyway just yet. For other skies, noodle around out at Skywatch. I snapped the packet of pepper with my fingers before ripping it open to pour the tiny black specks onto my pea soup. In the process some pepper spilled onto the cafeteria table. Stirring the soup, waiting for it to cool, I brushed the pepper into a small cloud; then ran my finger through it to simulate winds, creating a kettle of hawks. 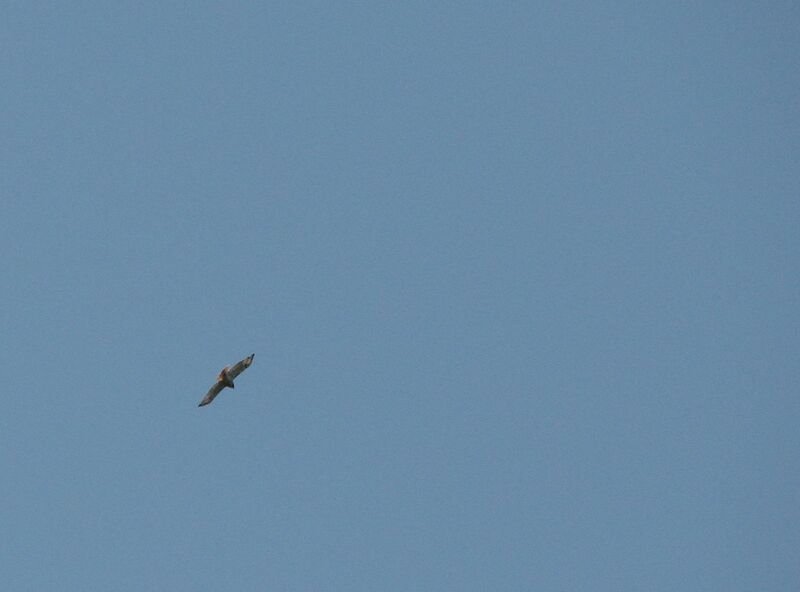 I was missing the single biggest migration of hawks on the planet. Broad-winged hawks gather in large flocks to migrate together down from the north adding more and more birds until there is a river of raptors in the tens of thousands flowing past Veracruz, Mexico. One day I want to see that spectacle. But for now, a small piece of that is happening along the ridges of the north. I, however, was at work. Mount Peter had a terrific day yesterday wth 4222 kettling Broad-winged Hawks, like the finest grind of a quality black pepper. The watchers on the platform carefully counted them as they flowed to the south. Today another 3564 flew past. I was still at work. But I get the reports and can vicariously revel in the numbers and see them in my mind’s eye. Broad-winged hawks travel 70 miles a day. Hopefully some of them will have nested way, way in the north and will still be making there way south by the weekend. I will be on the platform craning my neck wishing them fair winds and good speed.